Ever wonder what the ingredients are in Johnny’s Seasoning Salt? For the past couple of years I have been making my own seasoning mixes. I recently ran across this recipe for homemade seasoning salt, so I decided to give it a try. It was definitely worth the couple of minutes it took to make it. I decided to double the amounts of the original recipe. It perfectly fit in a pint sized canning jar. You can cut the recipe in half if you don’t want to make as much. Measure all ingredients into a pint sized canning jar or other air-tight container. Put the lid on the container and shake to combine. Use as you would store-bought seasoning salt. What I love about this seasoning salt is how much flavor it has. The smoked paprika really adds a lot of flavor to it. Another added bonus is that it doesn’t contain any MSG! Great for people who are trying to avoid artificial additives and preservatives. 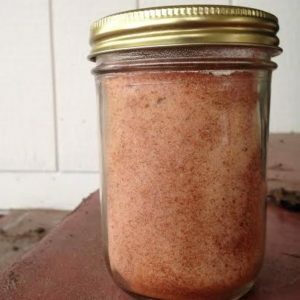 If you love Johnny’s Seasoning Salt, then give this recipe a try! Note: This recipe contains no MSG, but it does contain a lot of salt. So if you are watching your salt intake, use this seasoning sparingly.